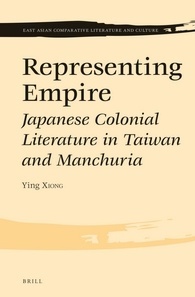 Ying Xiong’s important new study of Japanese colonial literature illuminates the complex nature of cultural production in the Japanese empire through focus on the careers and experiences of two Japanese men active in the literary worlds of Manchuria and Taiwan. At the heart of the book is the question of how Japanese travelled from the metropole to the colonies, and there positioned themselves vis-à-vis the larger empire and their identities as Japanese. In Taiwan, Nishikawa Mitsuru 西川滿 (1908-1999) was active as a writer and folklorist. In Manchuria, Ōuchi Takao 大内隆雄 (1907-1980) was a China expert who promoted pan-Asianism while working as a writer and translator. Xiong divides this study into three main sections, which examine nationality through Nishikawa’s work, pan-Asianism through Ōuchi’s, and Japanese imperialism in both. Xiong ably “investigates the interplay among imperialism, nationalism, and other transnational forces” that complicated the two writers’ respective positions as members of a nation and an empire (xvi). Xiong demonstrates that, despite their distances from each other, Nishikawa and Ōuchi shared similar life trajectories as they were drawn to the Japanese imperium; they participated in the general research atmosphere and achievements of empire and contributed to its consolidation while questioning their own attachment to it. A major focus of Representing Empire is how Japan, its people, and empire were imagined. Xiong calls for the problematizing of words such as “Japan” and “Japanese people” as imagined and constructed political units that involved a central Japanese metropole as well as its colonies. Xiong reveals varied “conditions and constraints” that were placed on, or taken up by, writers who identified as Japanese while living abroad, forging self-identities within their nation’s ever-expanding empire. The volume seeks to expand upon previous books on literature produced in Japan’s empire that have tended to remain within the confines of national history. In many ways it is successful. Xiong illustrates from several vantage points that Japan developed a form of what Robert Thomas Tierney and Robert Eskildsen have termed “mimetic imperialism” (29), which did not copy European bourgeois concepts of empire, but rather altered them, a reflection of the significantly later emergence of the Japanese empire relative to those from Europe. From the late 1900s, the Japanese government sought to establish an imperial supremacy and legitimacy that accorded with contemporary international realities and thereby developed a “distinct imperialism” (29). Xiong argues that this imperialism differed from Western forms of imperialism in terms of its lack of racial discrimination, which was seen as unable to inspire local consent to Japanese rule among its Asian neighbors. Instead, “Japanese imperialism resorted in fact to the rhetoric of racial and cultural affinities” (30). That rhetoric, however, had little relevance to how the empire dealt with many of its subjects, especially in terms of the savage murders of civilians, treatment of comfort women, salaries for workers, and education or rationing policies. Xiong recognizes that such rhetoric collapsed into “no more than empty words to conceal colonial violence and discrimination” (30). Yet it is from within the knowledge and power systems generating such empty words that Xiong seeks to present a fuller picture of cultural production in the Japanese empire. Taiwan and Manchuria offer substantially different environments for Xiong’s analysis. Taiwan was colonized in 1895 and, over the course of five decades, local policies and priorities shifted in turn with changing demands from the metropole, especially after the start of the Second Sino-Japanese War in 1937. Xiong writes that Nishikawa Mitsuru, despite living in Taiwan for many years, identified first and foremost with Japan, and that his overriding concern was to forge a legacy there. Nishikawa is shown to have been ambivalent toward the Japanese empire and his nation’s interactions with other cultures. Xiong demonstrates that Nishikawa’s poetry was a product of colonial transculturation and translingual practice, featuring Japanese language, Chinese poetry, and Taiwanese elements, despite the latter apparently not capturing the imagination of his target Japanese audience to the same extent that Manchuria did. Xiong devotes considerable space to discussion of Nishikawa’s allusions to Taiwan, which at times were not always clear enough for this reader to distinguish from China more generally. Significantly, Xiong notes that local Taiwanese could not relate to Nishikawa’s writings, which a Japanese commentator says exhibited a form of colonial exoticism. By the 1930s, Nishikawa and the colonial administration differed in their approach to Taiwanese customs—whereas he described them for Japanese audiences, the Japanese authorities sought their eradication. The tensions inspired by this conflict provide an additional conduit for interpreting contemporary Japanese society of the time: through further investigation of Xiong’s observation of the 1935 disappearance of chrysanthemums–symbolic of the Japanese royal family—from Nishikawa’s folkloric works, and their replacement by Taiwanese jasmine. Ultimately, decades after the loss of empire, and despite Nishikawa’s ambition to forge a legacy in the Japanese metropole and his postwar listing as a war criminal, his work today appears to be most celebrated in Taiwan. The second writer Xiong examines is the Manchuria-based China expert Ōuchi Takao, who is shown to have developed an early anti-Guomindang stance and opposed Japanese dictatorship over Chinese literary and artistic creation. He enjoyed strong connections with Chinese writers such as Yu Dafu and Guo Moruo, and yet enthusiastically supported the establishment of Japan’s puppet state of Manchukuo, an endeavour that he believed would benefit locals in opposition to what he viewed as exploitative Chinese and Japanese bourgeois rule. Ōuchi became very active in Manchukuo, publishing and translating a considerable volume of work. While Japanese contemporaries viewed the local Chinese-language literature as too sombre, Ōuchi was committed to encouraging local production and translating it for Japanese audiences. Xiong does an excellent job of demonstrating how Ōuchi’s own writings fundamentally differed from those of his Chinese counterparts; chief among the differences was support for a proletarian utopian Manchukuo. The most significant of Xiong’s revelations regards the nature of Ōuchi’s translations, which are shown to be at times radically different from the original works. One insightful example is found in Liang Shanding’s 梁山丁 Green Valley (綠色的谷 ; 1942). The two original lines, translated from Chinese to English are: “I love my broken country. I do not love this prosperous heaven.” Ōuchi translated these into Japanese as: “I love my country as well as this heaven” (216). Numerous similar examples cited by Xiong suggest that this was not a random mistake but rather a result of Ōuchi’s political convictions, which at times put him, as with Nishikawa in Taiwan, at odds with officialdom. Xiong nicely illustrates the extent to which Ōuchi was entrenched in the “colonial complexity” that developed in Manchukuo (253). After 1945, Ōuchi returned to Japan to write of his experiences; in China, his name lay forgotten for decades. For all the strengths of the volume, and there are many, there are a few issues that Xiong might have contended with in a more useful way. There remains the question of Nishikawa’s engagement with “fascism” or “aesthetic fascism” (104). Xiong suggests that there was inadequate space to resolve this question in the book, but it is a question that stays with the reader and seems rather pertinent, especially considering the views of some of his Taiwanese critics. Additionally, the first two Greater East Asian Writers Conventions are discussed in some detail, whereas the third is not mentioned at all. Also, Xiong’s move away from national boundaries would be enhanced by more in-depth discussion of the two Japanese writers’ reception among Chinese and Taiwanese readers and critics, and it would be useful to learn the extent to which Ōuchi’s translations altered Chinese writers’ treatment by Japanese colonial officials. To wit, is there any evidence that their work was used to bolster the claims of Kingly Way (王道) successes and assimilation that the colonial officials were so ambivalent about? English-language words such as “prostitute” and “superstition” are heavily freighted, yet the implications of their usage in this study are not fully addressed. Finally, as with other recent Brill publications, the illustrations are beautifully reproduced, but the press might have engaged in a more thorough copy-edit and included a more complete index. Representing Empire is an outstanding accomplishment, at once making clearer and complicating our understandings of the literary worlds of Manchuria and Taiwan, and the greater imperial empire within which all were transformed. It is an excellent addition to works such as Karen Thornber’s Empire of Texts in Motion. These volumes add substantially to the ways in which Japan’s empire and twentieth century East Asian history more generally might be interpreted. They stress the usefulness of analyzing historic transnational forces and further illustrate the importance of interrogating the wide-ranging interactions that the people of East Asia had with each other. The one far in the north, the other in the south, Manchuria and Taiwan were once constituent elements of the Japanese empire, with varied traditions and ties with Japan that need to be more fully fleshed out to increase awareness of, and appreciation for, the complexities of their shared histories. As Ying Xiong makes clear in this time of troubled diplomatic relations between the two Asian powers, historic Sino-Japanese literary worlds still offer us much to learn.